Spring is all about nature coming to life, it’s about green and fresh, about young and tender. Unfortunately new potatoes aren’t out yet but, while waiting, I decided to put some good old fashioned russet potatoes to good use. 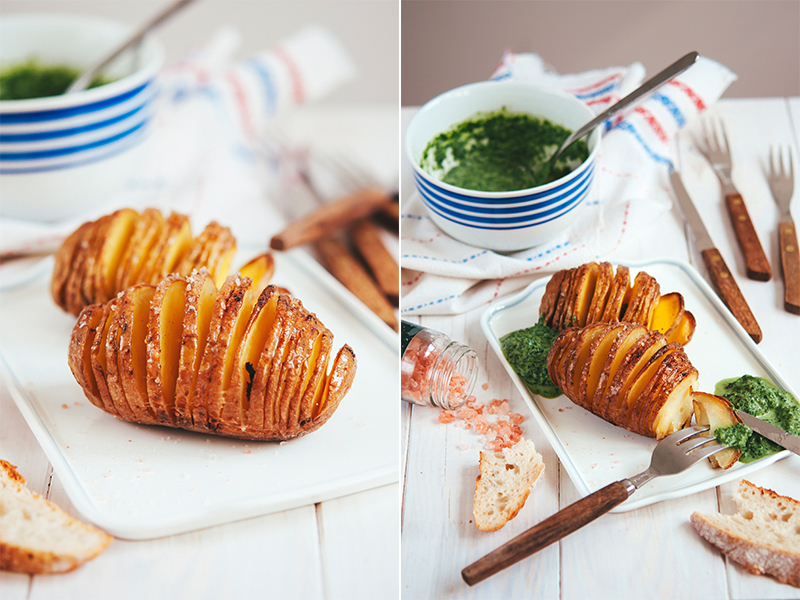 My hubby thinks that “food is all about the sauce” (he’s not a foodie, so let’s excuse his ideas :), so I thought I should make him happy by adding some creamy spinach and ramps sauce to his Hasselback potatoes. Why the combination? Because I wouldn’t dream of any spinach combination that excludes garlic and ramps ARE wild garlic. I figured it would give it consistency and a milder flavour since all the greens used were raw. I was not wrong. Preheat the oven (with grill) to 200°C fan-forced/gas mark 6/400ºF. In order to cut the potatoes equally, put each potato, in turn, in the bowl of a large wooden spoon and cut across thinly. Alternatively, you can place the potato lengthwise between two parallel wooden spoon handles and cut: the knife will hit the wooden handles and won't cut the potato all the way through. In a saucepan heat the olive oil and butter; add the crushed garlic cloves and braise for a couple of minutes, just so that all the flavour incorporates in the fat. 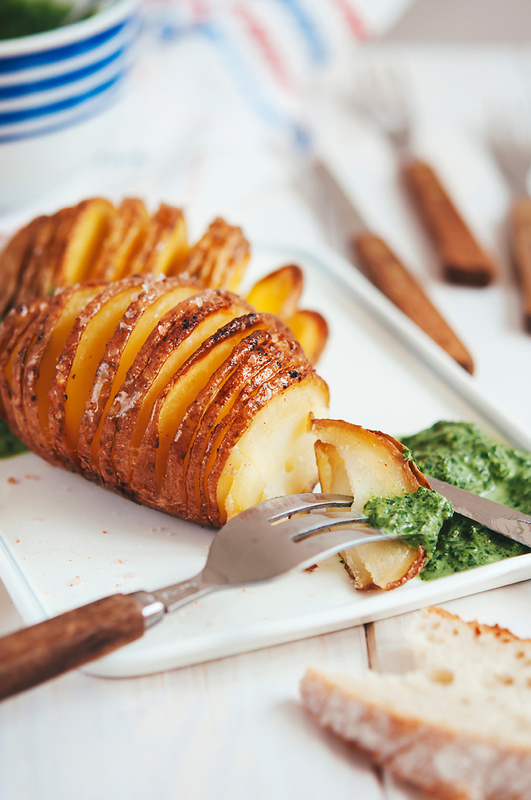 Place the potatoes on a baking sheet and spoon the fat over them, then sprinkle with Himalaya salt and ground black pepper; put in the oven and cook for about 1 hour. I used the grill function for the first 30 minutes and the fan-forced function during the entire baking time: this lead to a reduction of the baking time to approx. 45-50 minutes. Test to see whether the flesh is soft, then remove from the oven. While the potatoes are baking, make the sauce. In a large saucepan (no oil) add the spinach and braise just until the leaves soften. Remove from stovetop, add the leaves to a processor together with the ramps, sour cream or tofu, salt and pepper and mix well until you have a creamy sauce. Pour over potatoes and serve warm. I loved the result: it was such an ode to spring! 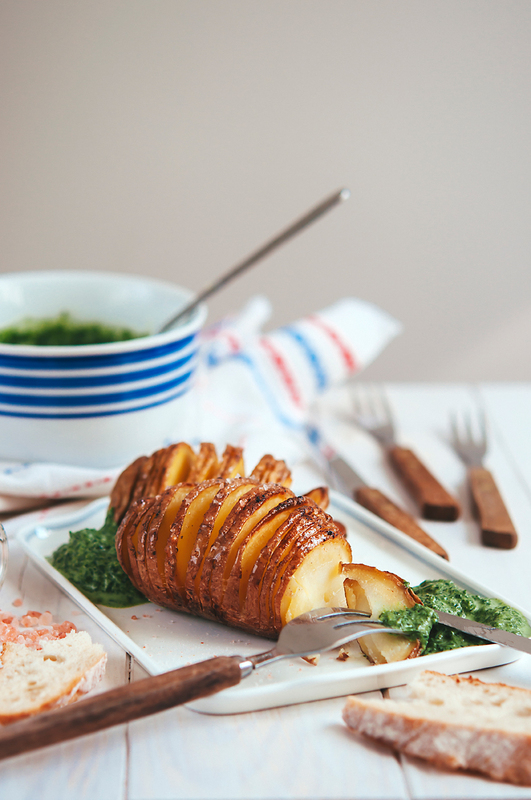 The potatoes were, as expected, crunchy on the outside and creamy on the inside, and the sauce simply brought everything together, with its creaminess and fresh perfume. 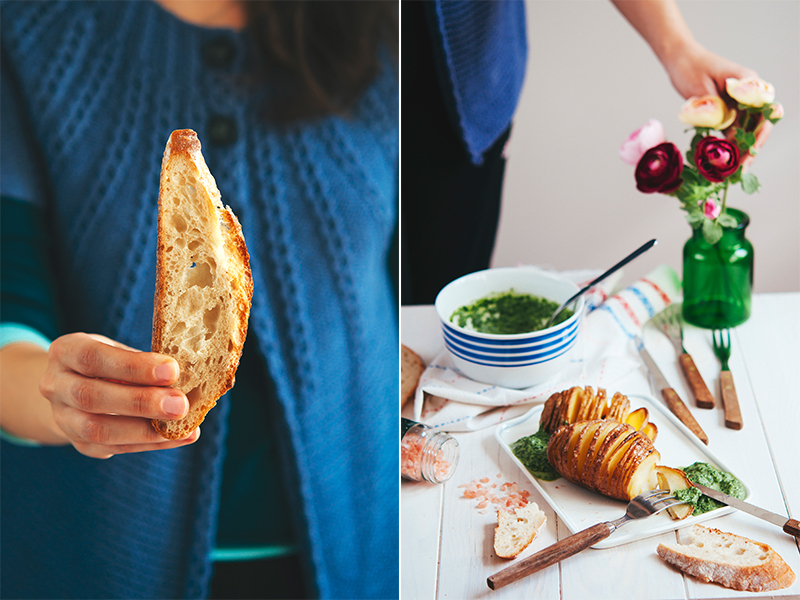 I had a wonderful sourdough baguette to dip in the sauce (ok, so I cheated a little bit) and I felt like life couldn’t get any better. 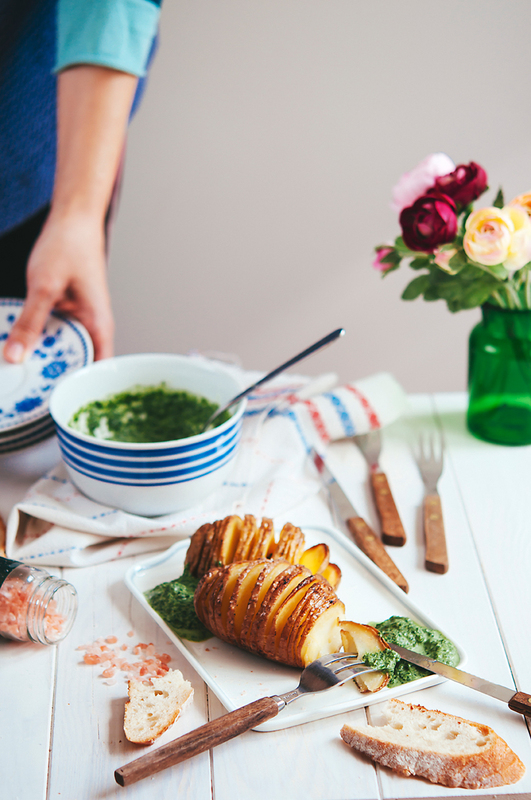 Andie, I just came across your beautiful blog through foodgawker! Love your photos! Yes, you definitely can use sea salt, I used Himalaya because it’s my default :)) I love how lovely and pink it is, plus, I am always sure that it’s pure and good quality. Keep in touch! Genie, I can’t believe it, I also have a bunny!! His name is Mister Pufu, he’s a white angora, he’s 5 and he lives with us in the house :) It’s crazy how sweet and smart he is! So happy to have found your blog too! You know, the first rule you learn when you become vegetarian is that all sides can be mains. True story. I simply increase the portions, add some salad, some crunch, and there you have it: an amazing vegetarian meal that’s satisfying for everybody, even omnis (my hubby is still an omnivore). 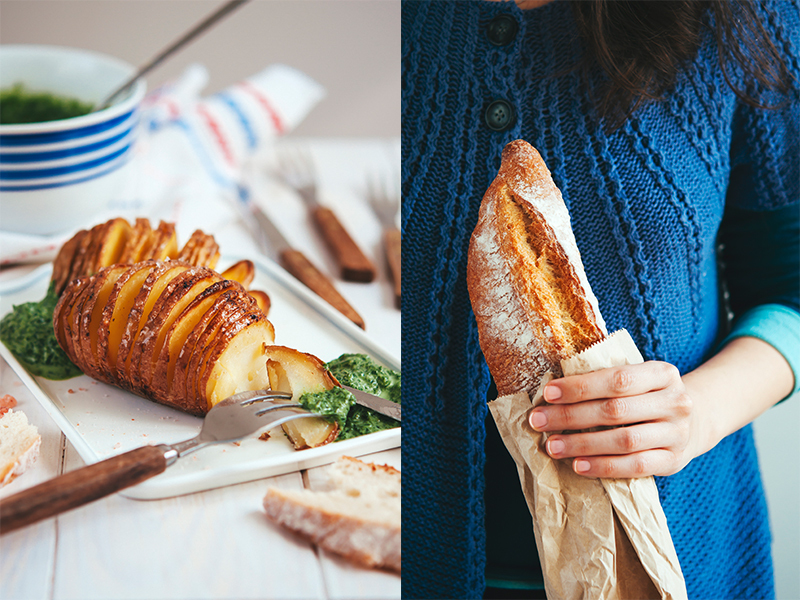 Now that you mention it, I think I’ll always think that hasselbacks=hassle :))) Although, truly, they were incredibly easy to make, I mean, if you use the wooden spoons and a sharp Japanese knife… piece of cake! Thanks for dropping by! Happy to have found your blog too Andie. I actually put my potatoes between a pair of chopsticks. My chopsticks are square rather than round so helps to stay in place. Same concept :) I find cutting food very therapeutic. I guess the focus, ritual and outcome is really satisfying. That’s even better. Actually, at first I tried to find something wooden and square exactly because of the non-slip factor, but it didn’t occur to me to use chopsticks. For me, cooking in general is therapeutic, my kitchen is my spa, except for when I have to cook a lot or cater for parties… it’s still fun, but not relaxing, quite the other way around..
Hi, had this for lunch today and it was great. I made a load more of the sauce (vegan version) though as I like plenty on my meal, but this didn’t require too much. As a result I have quite a lot left and wondered if anyone knew if it freezes and keeps okay?